Well, if nothing else, Norman Foster’s hauntingly named Kiss the Blood Off My Hands has to be the leader for best film title in the countdown! There isn’t another title in all of cinema that sounds more perfectly fitting for a noir. 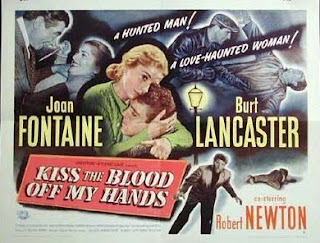 Despite this lurid title, it remains a little-seen noir gem, which is shocking considering the stature of the two stars, Joan Fontaine and Burt Lancaster. After searching the ‘net to gauge the consensus opinion of the film, it seems that most of those that have managed to see it consider it to be a bit of a letdown. I have certainly come across positive assessments – Goodfella’s friend Tony D’Ambra acknowledges it to be a fine noir – so I might be among the few that rank it this high in a countdown of this scope. Truth be told, it nearly ended up even higher than this, so there is no doubt in my mind that this has to be considered among the most underrated films of the classic noir cycle. Lancaster stars as Bill Saunders, a man who has come to England after surviving a Nazi POW camp during the Second World War. His experiences as a prisoner have done sever psychological and emotional damage, leaving him a volatile person. While sitting in a pub, drowning his sorrows in alcohol, Bill gets drawn into a fight that results in him killing a man. Fleeing through the darkened streets of London, he climbs through an open window into the apartment of unsuspecting nurse Jane Wharton (Joan Fontaine). Believing Bill when he says everything was an accident, the two miraculously begin a relationship together. That relationship is interrupted, however, when Bill gets into an altercation with a police officer and knocks him unconscious. Sentenced to six months in prison and a lashing with the cat o’ nine tails, Bill goes off to jail while Jane goes on with her life. But when Bill is released, he seeks out Jane and begins to try and rekindle the relationship. Jane gets him a job driving a truck that makes deliveries of medical supplies to rural districts. 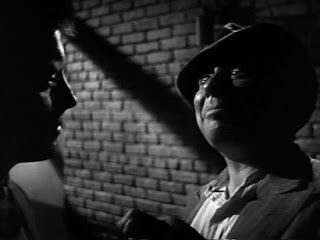 This peaceful life is soon shattered, though, when the devious hoodlum Harry Carter (Robert Newton) confronts Bill. Carter was a patron inside the bar the night that Bill killed the man in a fight and wants to use this info to blackmail him. He wants Bill to cooperate on a robbery of one of his shipments, so that the drugs can be fenced on the black market, otherwise he will go to the cops. Bill reluctantly decides to comply, but when Jane decides to come along on this particular delivery, things quickly spiral out of control. In the entry for Journey Into Fear, which was #85 in this countdown, I mentioned that I didn’t find the style and achievement of that film to be above anything that Norman Foster could have done. I certainly acknowledged the obvious Welles influence, but I pointed out that there were other noirs undoubtedly led by Foster that were superior to the very good Journey. Kiss the Blood Off My Hands is at least one example of what I had in mind. His direction here is superb, with a number of sequences that just ooze noirish atmosphere. The opening of the film, with Lancaster’s Bill dashing from building to building, hiding behind walls and in shadows is a thrilling opening. 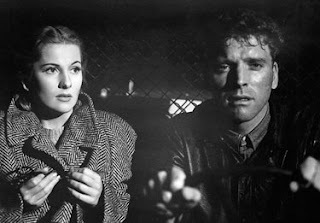 Director of photography Russell Metty, who is making his second appearance in the countdown (he also worked on The Stranger), truly shines in his use of shadows on the waterfront. Although this remains the most impressive sequence in the film, there are others that are also striking. The other that comes instantly to mind is the staged hijacking sequence, as Bill has second thoughts about going through with the plan. When he exits the truck and, with rain pouring down, approaches the waiting goons, things build to a violent crescendo. The story is far from flawless. It takes a suspension of disbelief – or, at the very least, a strong belief in some sort of weird Florence Nightingale-like syndrome – to have the budding romance between Bill and Jane feel entirely genuine. What makes such minor complaints useless is how effective everything else is. Bill is the personification of the noir elements of isolation and a life spiraling out of control. Lancaster delivers a seething performance, putting the character across as someone who, even when things are going well, is maintaining only a tenuous control over his emotions. His life, as is shown on screen, is a combination of terrible luck and equally bad choices – think about it, what are the odds of killing a man in a traditional fist fight? It happens to Bill, which could be chalked up to bad luck. But the fact that he constantly finds himself in such situations means that blame also has to be leveled at the man himself. Thus, he is someone that you can’t help but root for, but at the same time realize that he is at least part of the reason for his problems. This is another one without a proper DVD release and that I’m guessing has little chance of popping up on TCM any time soon. Hopefully I’m wrong on that second point, otherwise it’s burnt DVDs or the Internet for anyone that wants to see it. Even if that’s the case, I’d still recommend the effort. It’s certainly worth it. A nice review Dave. This one has all the elements of noir and a great cast. I think it must be Foster's best picture, a contributing factor being Metty's lensing - even greater directors do better with certain DPs. Miklós Rózsa's score is great, and Lancaster and Fontaine really shine as the two lovers. I would be less hard on Bill. It is not so much that he makes mistakes, but that psychologically he can't control his anger, and this is what gets him into trouble. The real tragedy is the past not letting him go, and the final denoument is pretty much ineluctable, and fate may still not have finished with the two lovers. Yes it indeed worth the effort Dave. I wound up seeking this one out because I am a huge Miklos Rozsa fan, and had heard this showcased an especially great score by him (which it did as Tony asserts too) You do a fine job here framing the sequences that are particularly memorable, and there's no question the film is underrated, hence it's failure to secure a proper DVDrelease. More superlative work by DP Metty. Have not seen this in many years Dave and do not recollect much too even comment. The failure of a DVD release does not help the visibility of this film. Lancaster and Fontaine are a good match. The usual fine review. Sorry, guys, I've been busy all day and haven't had a chance to respond until now! Tony - Thanks for the compliment. Your point about Bill is actually quite good and you're probably right, just depending on how scarred you choose to believe he is -- which it seems obvious that he is. It is close to Foster's best picture, IMO, if not #1. Sam - I agree with everything you say. I didn't allude to Rozsa's score, but I tend to gloss over some outstanding contributions from composers with most reviews. It's not intentional, but it is not necessarily my focus either. John - Thanks and I agree that this one would be much more popular with just an adequate DVD release. C.K. - I've stopped by at Hollywood Dreamland. Once again, thanks for the award. A running log of the films that I am watching, along with the sometimes rambling and random, hopefully insightful, thoughts on the films. Just adding a spot here for a running log of films that I have recently watched and that do not fit into the context of what I'm writing about for the blog at the moment. This is a way for me to at least bring up recent movies that I have watched and enjoyed or disliked. I'll admit to completely ripping this off from John at Twenty Four Frames, but it's a brilliant idea to allow me to broadcast what else I've been watching. It will just be a simple movie title and a rating on a 10-point scale, with the rating being based on nothing but my own taste and enjoyment. What are the Perfect 10 Reviews?